Classes for all ages: Tuesday and Friday 5:30PM to 6:30PM. Saturdays 12:00PM to 2:00PM. Teen/Adult-only class: Tuesday and Thursday, 8:00PM to 9:00PM. 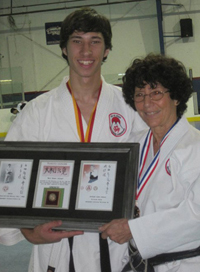 Go Ki Dojo teaches students of all levels, beginners through advanced, in traditional, mixed-level classes. Mixed classes are divided into age-based groups. Classes are held Tuesday, Thursday, and Friday evenings, as well as Saturday afternoons. Typical classes focus on blocking and striking basics (kihon), forms (kata), and for intermediate and advanced students, sparring (kumite). Children's groups include frequent drills designed to develop coordination and balance. Students of all ages will find that as they progress, their balance, flexibility, strength, and endurance will improve significantly. Not only will their overall fitness increase, but their focus will also improve, which is often an important benefit to children, aiding them in concentrating not only in karate classes but in school, as well.